Barcelona, 7 de abril del 2014.- Según informa hoy el portal especializado, SiliconWeek, la inversión en TI aumentará más de un 3% durante el presente ejercicio. El segmento que más crecerá será el del software empresarial, con un gasto previsto de 320.000 millones de dólares y un aumento del 6,9%. La clave está en la pujanza de todo lo relativo a Social, movilidad, cloud y análisis de datos, por ejemplo en las áreas de CRM, gestión de bases de datos ( DBMS ), herramientas de integración de datos, etc. The future Regulation of Data Protection continues on standby, after the regulations in process have been discussed at an informal meeting of Justice and Home Affairs, held on January 23, already under the Greek presidency. In the Council on March 6, this issue was again addressed. Negotiations to achieve a consensus regarding the normative text, for now, do not bear fruit. Ecommerce Europe, European employer of e-commerce that brings together 41 organizations from 35 countries and to which adigital belongs, points out the high probability that the regulation will not be approved in the current mandate, although it is highly unlikely that this legislative initiative will be completely shelved and considers that there is a better chance of resuming the processing and negotiation of the reform from scratch or from some point in the process, after the European Parliament elections in May 2014. The European Commission is monitoring the transposition into the domestic law of the Consumer Rights Directive by the Member States, which must do so before June 2014. In the case of Spain, the draft Law for The Defense of Consumers and Users has just finished its phase of amendments in the parliamentary procedure in Congress. The regulations on ADR (Alternative consumer Dispute Resolutions) and ODR (Online consumer Dispute Resolution) or on extrajudicial alternatives for the resolution of conflicts that affect consumers, pursue the purpose of achieving a common European system at the same level in all Member States. At European level, the ADR Directive and the ODR Regulation came into force in mid-2013. Member States are given a period of two years to transpose the Directive. The ODR platform will be available by the end of 2015. On 28 January, the ECON Committee of the European Parliament proposed amendments to the Payment Services Directive, which, however, is very likely, according to Ecommerce Europe, that it will not go ahead before the elections in May 2014. Also together with this Directive There is the Proposal for the regulation of exchange rates for operations with cards. This directive will allow the entrance of new players in the market of payment services, which will be obliged to comply with high standards of regulation and supervision, as well as other payment institutions. The regulation on payment services will also promote the development of innovative means of payment through mobile and Internet. In the processing of the Regulation for electronic transactions in the internal market: electronic identification and online trust services, a three-party meeting was held between the Commission, the Parliament and the Council on 28 January, in which they demonstrated the divergences with respect to the date of application and with respect to the issue of liability in case of damages to consumers. The regulation aims to strengthen confidence in electronic transactions in the internal market and ensure mutual cross-border recognition of electronic identification, authentication, signatures and other online trust services. With regard to the proposal of the Common Sales Law Regulation Proposal, the three-way negotiation between the Commission, the Parliament and the Council does not seem to begin in the near future, given that the Council has not yet adopted a general position . Thus, in the Justice and Home Affairs Council of December 5 and 6, it became clear that the Member States are not ready to adopt the content of the Proposal. The main divisions between States revolve around the definition of cross-border or cross-border. This proposal for a Regulation addresses the creation of an optional contractual standard for the entire EU in order to promote growth and lower the cost for companies derived from access to new markets, while offering consumers a wider range of services. products at more competitive prices. On December 17, 2013, the European Commission published a Roadmap as an answer or follow-up to the Green Paper on parcel delivery: An integrated market for delivery and logistics for growth of ecommerce). This roadmap is based on other regulatory initiatives such as the Ecommerce Communicaton (2011), the Postal Services Directive, the Consumer Rights Directive, the proposed European Sales Regulation or the roadmap for a single European transport area . A period of 18 months is now open to analyze whether it is necessary to adopt additional measures. For its part, the European Parliament Arias Echevarría has initiated a report for a resolution on the matter as a reaction to the initial Green Paper of the Commission, which was discussed and adopted in the Committee IMCO of the European Parliament, to which the Committee on Employment and Transport Parliament will give their opinion in the first quarter of 2014. On the other hand, with regard to the review of the regulation of the taxation of the digital economy in the EU, the group of experts for this matter held its second meeting on January 21, where, among other points, they addressed their own business models. of the digital economy and analyzed where value is created in the chain of the digital economy in order to analyze the most optimal and equitable taxation. The next meeting of the group of experts will take place on March 13 and 14. Also, in the field of cloud computing service contracts, a group of experts was created within the framework of the European Commission, which held its first meeting on 19 and 20 November. It is expected that in terms of hiring cloud computing services with SMEs and consumers, a Policy Paper will be prepared for this coming spring and a public consultation will be launched. 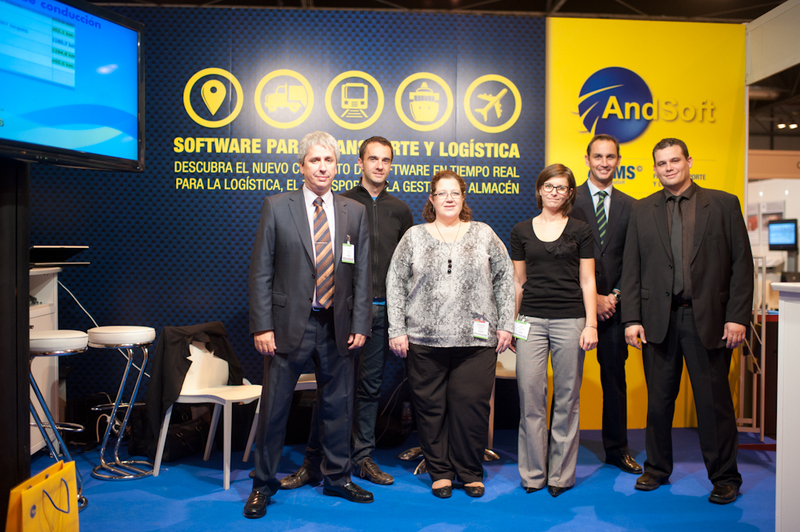 Madrid, 20 de octubre del 2013.- AndSoft, empresa europea, experta en software full web-colaborativo para empresas de transporte, logística, soluciones in company y computación en la nube, es empresa expositora (stand B18) en la tercera edición edición del Salón Logístics Madrid, los próximos 13 y 14 de noviembre en Feria de Madrid (Campo de las Naciones). Barcelona, 1 de octubre del 2013.- The portal Mashable today published an interesting forecast trends that will star in electronic commerce.We reproduce agree fully because most of the analyzes. To read the original text, please visit: 10 predictions about the future of Ecommerce. Barcelona, 1 de octubre del 2013.- wtransnet y AndSoft, empresas de ámbito europeo, expertas en soluciones para empresas de transporte, logística, han acordado una nueva alianza estratégica. 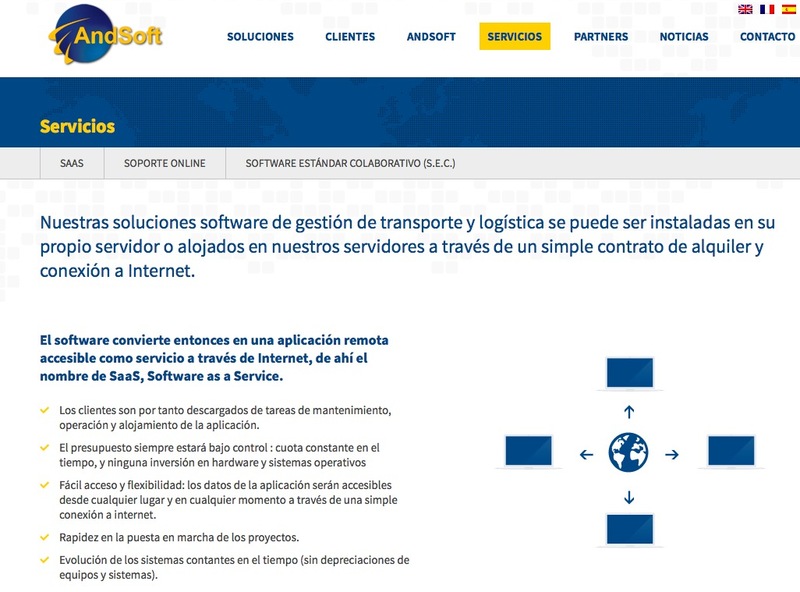 En concreto, se trata de la integración bidireccional del ERP de AndSoft, e-TMS, con la plataforma tecnológica de wtransnet. Esta Bolsa de Cargas se fundó en 1996 y se ha consolidado en el mercado español y portugués como líder en el desarrollo de bolsas de cargas y avanzados sistemas on-line para la gestión de proveedores. wtransnet está presente hoy en 23 países de Europa y America Latina a través de más de 9.000 empresas. Jaime Esteve, Director General de Wtransnet, detalla que: “Los acuerdos estratégicos entre Partners tecnológicos globales nos realzan a todos competitivamente y facilita la gestión a beneficio de nuestros clientes mutuos, cosa que entendemos obligada hoy en día por parte de las empresas tecnológicas que trabajamos en el sector del transporte y la logística”. Por su parte, Víctor Vilas, Director Desarrollo de Negocio de AndSoft, ha explicado los beneficios de este acuerdo: “Con un solo click nuestros clientes publicarán sus necesidades en la plataforma de Wtransnet. Así de sencillo y rápido. Será una de las principales ventajas de la integración entre ambas plataformas tecnológicas. Con esta propuesta, vamos a garantizar un aumento de la productividad nuestros clientes españoles y del resto de Europa, ya que también se van a beneficiar nuestros más de 150 clientes de fuera de España que a su vez trabajan con la plataforma wtransnet, ya que son también un referente europeo”. Esta integración incluye publicación de forma global de las cargas sin dobles trabajos de introducción, y automatización de proceso. El acuerdo tecnológico entre AndSoft y Wtranset dinamizará el mercado del transporte terrestre. Según un estudio comparativo realizado por Wtransnet durante el período enero-abril en los años 2012 y 2013 para cargas ofertadas con origen Barcelona, Vizcaya, Madrid y Valencia y destino a cualquier ciudad de España, se observa un incremento medio del 5%. Por provincias, Vizcaya es el punto que registra un mayor incremento, con un 24% de media y es la zona con un mayor aumento de las cargas con destino nacional, seguida de Barcelona (11%) y Valencia (5%). Madrid sufrió un marcado descenso en el mes de marzo (con un 21% menos de cargas ofertadas,) lo que supuso un cuatrimestre del 5% en negativo. De los cuatro meses analizados, se observa una evolución positiva en todos ellos excepto en el mes de marzo, debido al período de Semana Santa y al descenso de las ofertas en la provincia de Madrid, que incide directamente en el resultado global del mes, con un descenso del 7%. Barcelona y Vizcaya son las dos provincias que han tenido una evolución positiva durante todos los meses analizados. 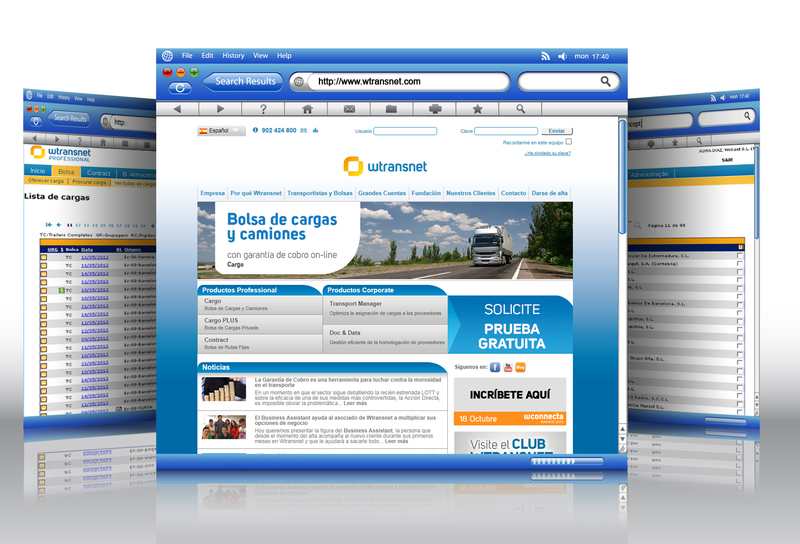 “Con un solo click nuestros clientes publicarán sus necesidades en la plataforma de Wtransnet. Así de sencillo y rápido. Será una de las principales ventajas de la integración entre ambas plataformas tecnológicas. Con esta propuesta, vamos a garantizar un aumento de la productividad nuestros clientes españoles y del resto de Europa, ya que también se van a beneficiar nuestros más de 150 clientes de fuera de España que a su vez trabajan con la plataforma wtransnet, ya que son también un referente europeo” (Víctor Vilas). Barcelone, le 1er octobre 2013. Wtransnet et AndSoft, deux entreprises européennes expertes en solutions dans le domaine du transport et de la logistique, ont conclu un nouvel accord stratégique. Il s’agit de l’intégration bidirectionnelle de l’ERP d’Andoft, e-TMS (e-Transport Management System), avec la plateforme technologique de la bourse de fret Wtransnet. Créée en 1996, Wtransnet s’est imposée sur le marché espagnol et portugais comme leader dans le développement des bourses de fret et de systèmes online de gestion des fournisseurs. Wtransnet est aujourd’hui présente dans 23 pays en Europe et en Amérique Latine, à travers plus de 9000 entreprises. Jaime Esteve, Directeur Général de Wtransnet, explique : « Les accords stratégiques entre partenaires technologiques globaux augmentent notre compétitivité à tous, et offrent une plus grande facilité de gestion de nos clients communs. C’est un élément que nous considérons aujourd’hui comme une obligation, surtout de la part d’entreprises technologiques qui travaillent dans le secteur du transport et de la logistique. » Pour sa part, Victor Vilas, Directeur Commercial d’AndSoft, détaille les bénéfices de cet accord : « En un seul clic, nos clients peuvent publier leurs besoins sur la plateforme de Wtransnet. C’est aussi facile et rapide que cela. Ce sera l’un des principaux avantages de l’intégration de ces deux plateformes technologiques. Avec cette offre, nous allons garantir l’augmentation de la productivité de nos clients français et de l’Europe toute entière. En effet, celle-ci va également bénéficier à nos 150 clients qui travaillent avec la plateforme Wtransnet, qui est elle aussi une référence au niveau européen ». Cette intégration inclut la publication de manière globale des frets sans double travail de saisie, et l’automatisation du processus. Ainsi, si une commande est modifiée, l’offre sera également changée dans la bourse Wtransnet. De la même manière, si un camion ou un fret ont été attribués, ils seront effacés du système. L’accord technologique entre AndSoft et Wtransnet va donc permettre de dynamiser le marché du transport terrestre.